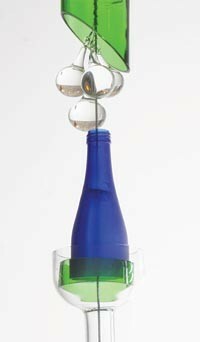 Spotlighting functional sculptures like the Power Flower, the Geek Art/Green Innovators festival gets off the ground. 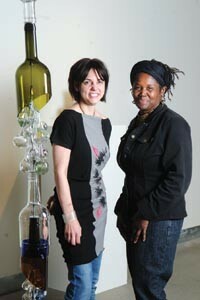 Pittsburgh Glass Center's Community Relations Coordinator Heather Joy Puskarich and GAGI Festival Director Christine Bethea pose with Melissa Fitzgerald's "Rainsong Seeks Water." A couple of years ago, walking in Mellon Park, artist David Edwards overheard a young girl tell her mother, "If everything worked like a flower, it would be great." Edwards wasn't quite sure what the kid meant. But the line planted a seed that took root in his mind. Eventually it blossomed into a piece of functional sculpture Edwards calls the Power Flower. Now the big aluminum sunflower whose petals are a windmill, and whose leaves cradle solar cells, is the icon for Geek Art/Green Innovators, a local festival premiering Fri., April 2. If you think "if everything worked like a flower" is a notion to inspire engineers as well as artists, meet GAGI founder Christine Bethea. The artist and educator said GAGI grew from local initiatives like Arbor Aid, a 2009 event teaming groups like Urban Tree Forge (which makes art from salvaged wood), urban-farming advocates Grow Pittsburgh and grassroots technology collective HackPittsburgh. Bethea, who makes her own art from salvage, sought to highlight the green common ground between artists and tech innovators. The fest includes a morning component for pre-schoolers. By night, it joins the Penn Avenue Arts Initiative's monthly Unblurred gallery crawl, including Power Flower demos; an exhibit of salvage-glass art titled From the Earth to the Fire and Back, and an eco-friendly fashion event, both at Pittsburgh Glass Center; and an electric-car display from Carnegie Mellon's Robotics Institute. Melissa Fitzgerald's "Rainsong Seeks Water"
"I see it all as a creative industry," Bethea says. "The lines [between] science and art are pretty thin." Edwards, 48, is living proof: He calls Power Flower "the intersection of art and technology." The largest Flower he's made is 14 feet tall, its stem a reclaimed aluminum boat mast, its base a reused plastic 55-gallon barrel. The solar cells and wind-powered generator charge a 12-volt battery. 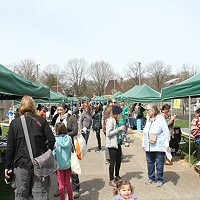 Since last summer, Edwards has shown his creations at events including Carnegie Science Center's Science Days; the Hot House fundraiser for the Sprout Fund (which partly funds Edwards' work); and A Fair in the Park. He tours a 5-foot-tall version to local classrooms. Rather, Edwards uses his attention-grabbing contraption to teach. He tells people that solar power is less about replacing fossil fuels kilowatt-for-kilowatt, than it is about reducing demand for energy enough that renewables can meet our needs. "The power of the Power Flower is the conversation it starts," he says. "I kind of have groupies, which is bizarre," Edwards adds. Some of the estimated 5,000 people who've seen the Power Flower later e-mailed him for tips building similar projects. For Edwards, creativity is a lifestyle. The Pittsburgh native dropped out of grad school to pursue carpentry. That led to decorative wood-carving and, finally, a career in art. In everything he's self-taught, from electrical wiring to making the giant chess sets (of wood, wire or recycled materials) commissioned by affluent clients; his paintings; and the sculptures in marble and limestone that populate his studio. While Power Flowers aren't for sale, Edwards' estimated asking price would be $10,000 -- expensive for home use, but affordable as public sculpture, his intended market. He sees the flowers as centerpieces for outdoor tables that would generate their own lighting -- or perhaps as self-powered garden pumps for the water in their rainbarrels. "What I'm really doing is, I created something and I'm learning what it is."